Big Brother is creeping into our lives, inch by inch, camera by camera, tower by tower. 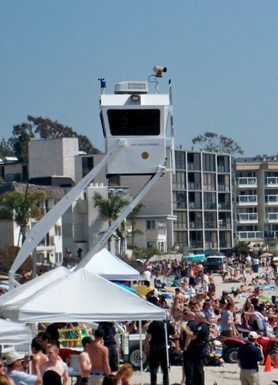 Recent posts on our blog have described plans by the City of San Diego to install surveillance cameras in and around Mission Bay, including one on the OB Pier, and that the San Diego Police Department dragged out their controversial mobile watch tower for this year’s first Floatopia. Surveillance cameras, police towers … Big Brother is definitely creeping in … do you remember the origins of Big Brother? He is a fictional character in George Orwell’s novel Nineteen Eighty-Four, the dictator with seemingly absolute control in Oceania, a society that is a totalitarian state. In Nineteen Eighty-Four, the “Party” – the ruling elite – have total power over their citizens. In his book, Orwell describes this nightmarish society where everyone is under complete surveillance by governmental authorities. This is accomplished mainly by telescreens – a two-way TV -, but also by cameras, and spies. The phrase “Big Brother is watching you” was constantly thrown at the inhabitants to remind them of their predicament. 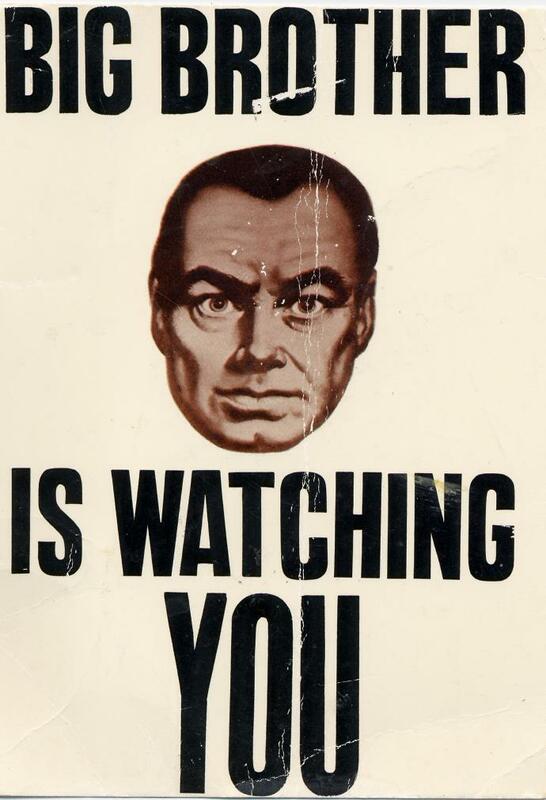 Since the publication of Nineteen Eighty-Four, the term “Big Brother” has become common-place in our language, and is used to describe any overly-controlling authority figure or attempts by government to increase surveillance or abuse of civil liberties by government power. Mobile police observation tower, Floatopia, March 2010. Over a year ago, the Union-Tribune reported that the San Diego Police Department, after some trial runs, was about to purchase a $119,000 mobile observation tower to assist them in law enforcement and crowd control. The two-story “… mobile observation tower … is similar to a cherry-picker lift with an enclosed pod at the top. The platform gives police a 360-degree vantage point through heavily tinted windows and allows them to direct responding officers on the ground below. … the pod is filled with a range of high-tech tools to help officers gather intelligence, monitor crowds and prevent crime. … The funds will come from a Homeland Security grant ….The cameras can zoom in up to three-quarters of a mile away and can be operated remotely. El Cajon police used one at the Westfield Parkway Plaza shopping mall, Christmas 2009 and 2010, among other places, to monitor crowds. They used Homeland Security funds to purchase their tower – which is very similar to the SDPD’s – in 2006 for $90,000. The Sheriff’s Department bought a tower about two years ago and has used it at several community events, including at the county fair in Del Mar. “It has assisted us in making arrests and has certainly been a huge deterrent,” said SDpolice Capt. Shelley Zimmerman, who has used the tower throughout the Northern Division as a test run. Brust said the tower, which is equipped with sensitive cameras, has also come in handy for intelligence-gathering. The mobility and functionality of the Frontier make it ideal for use at impermanent bases or as part of security operations around critical infrastructure facilities. Over a year ago, in our report, we quoted from the manufacturer’s online brochure, which definitely emphasized the military use of the facility. Then the brochure added that “due to varying levels of enemy activities” the Frontier comes in 3 different types of armor and gun ports. The Skywatch Frontier can be loaded with a significant array of surveillance and monitoring equipment as well as high level communications capabilities. The high profile also acts as a significant deterrent to enemy forces. Vantage point is everything when it comes to surveillance. SkyWatch™ units provide a high level platform for an array of surveillance options. Every tower includes the basics for the comfort and safety of the officer inside through adjustable heat and air conditioning, tinted sliding glass windows and comfortable seating. And no matter the application, only one person is required to set up and deploy a unit. The SkyWatch can easily be relocated and is rugged enough to handle even the most primitive off-road conditions. And all models are adaptable for cameras, radios, public address systems and other equipment integration. Now, one officer can cover an area previously requiring three or more personnel. 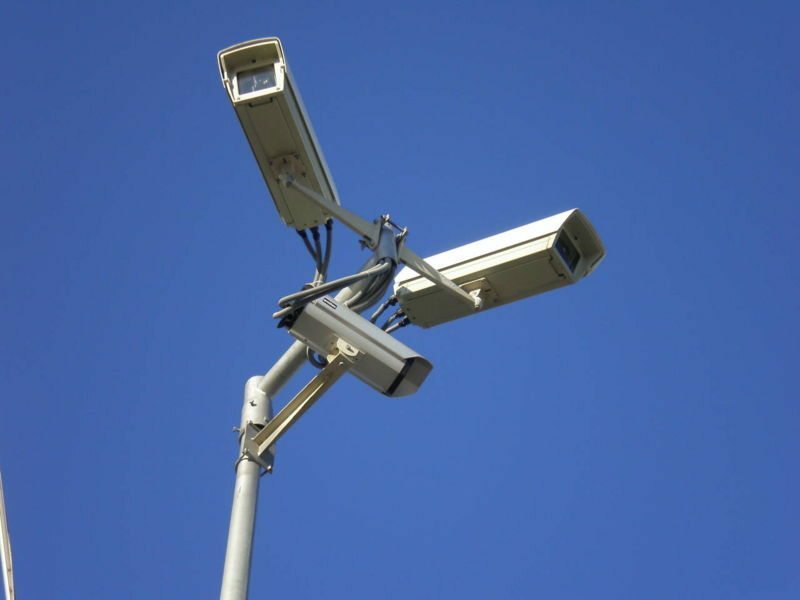 A couple of weeks ago, our blogger PSD posted a review of the City of San Diego’s plans for 16 surveillance cameras – primarily in Mission Bay – and one on the OB Pier. 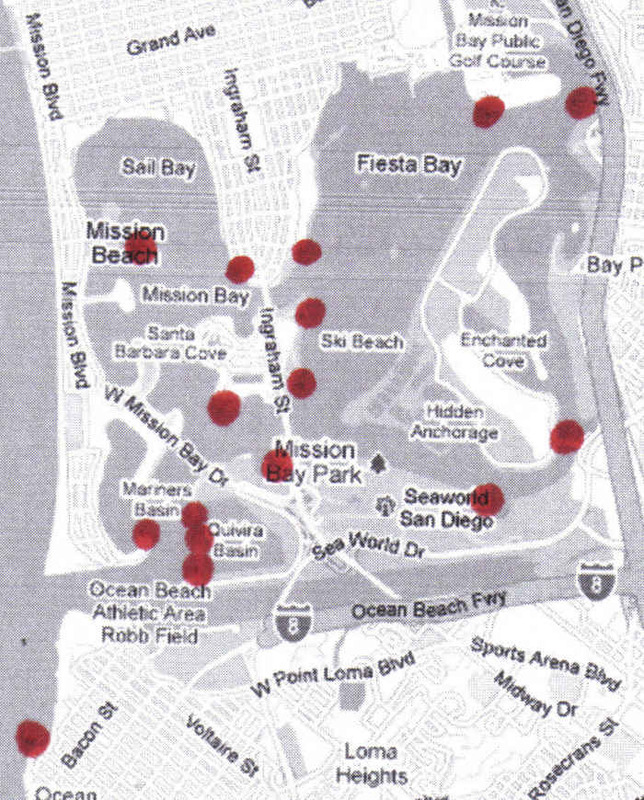 Including the OB Pier (exact location unknown) the cameras will be set up around Mission Bay – See Map. These cameras will have 360 degree rotation, high quality zoom capabilities for objects up to 300 yards, night vision and infrared to shoot 24/7, seven day storage, able to withstand extreme weather conditions and be enshrouded in bullet-resistant domes. Funding for these cameras is coming from the Urban Area Security Initiative, drafted in the wake of 9/11 and intended to provide money for anti-terrorism efforts to areas where the perceived threat of attacks was highest. Imagine, a government police surveillance camera on the OB Pier. Might as well call it the Oceania Beach Pier, in honor of Orwell’s Nineteen Eighty-Four. Here is my estimation of where the City wants to install the 16 surveillance cameras to monitor vessel, vehicle and pedestrian traffic in and around Mission Bay, based on descriptions from the Request for Proposal on the project. Heck, maybe it’s time for OB to catch up with the rest of society, and join the communities under the watchful lens of law enforcement. Surveillance cameras are everywhere. Now, there’s two types of these cameras: private cameras and government ones. For instance, there’s a private video camera on top of the OB Hotel run by the OBMA. It already takes in views of the Pier and whatever else is going on in and around the foot of Newport Avenue. And anybody can view it. I’m most concerned, however, with government surveillance cameras in public space or spheres. Yet, if cameras installed by the “private sphere” are used by government and/or law enforcement, then they are no longer “private.” And still, surveillance cameras in the private sphere can be just as “effective” as their “public” counter-parts. Think of all the places you’ve seen surveillance cameras … maybe not the 360 degree types, the bullet-proof ones, but watching lens at any rate. Many private facilities and buildings have these cameras outside. But they are inside many places as well. You see them in banks, in malls, sports stadiums, in elevators, office buildings, some restaurants, in casinos, convenience stores, ATMs, and in fact many workplaces have them, and many housing projects have them externally. Now, think of all the surveillance cameras you’ve seen or know of installed and run by various elements of the government: traffic signals, airports, freeways, the border fence, and some parks and beaches, some cities have them on their buses, trolleys, subway stations, and public schools, government office buildings, courthouses … the list goes on and on. While you mull this over, I’ll work on Part Two … of the Creep of Big Brother. can’t you love it! close down the libraries, cut schools back, take out the fire pits, but goddamn it! put in surveillance cameras and police towers. Who said this is a fact? Not a idea or a thought ? Has anyone asked the City ? Kevin F. ? or is it fodder ? Jim – at Frank’s behest I covered this a couple weeks ago (he linked me near the beginning of his article) – apparently this is a done deal, the city is currently considering contract proposals and will likely greenlight the camera installations by the end of June. I’m up for it, but I don’t own a Nixon mask. Will Guy Fawkes work? Can you say Emmanuel Goldstein? So, anti-terrorism funds for projects in OB/MB? Hmm. What do they expect to see? RPGs? Taleban? Osama? Ah, pot smokers! Underage drinking! Truants! Dogs at large! Now we’re talkin’. All about control; your lives and mine. Thank God they’re not wasting all that money on education or homeless shelters or something silly like that. Actually, I used to make my living building web interfaces for these things. calling all obceans! do not allow this surveillance camera on our pier to be installed. call your city council man kevin faulconer at 619-236-6622 to complain. Another thing to give us all a warm fuzzy is that real-time face recognition software is now and has been in use for close to a decade (maybe longer). It won’t be long until all of these watch towers have this software installed by default – or maybe they already do. Does anyone know? Reminds me of Minority Report, but fact of the matter is that most people in the mainstream are already tracked in everything they do including buying food, gas, using bank/credit cards, the internet, cell phones, you name it. Moreover, it has been proposed that every vehicle have “black boxes” installed “to collect statistics and improve safety.” Another reason is that it would be a means to track how many miles we drive and implement a tax accordingly. Whatever the reason is doesn’t really matter because in the end, we’re being tracked – we have been for several years and will continue to be tracked more aggressively in the future. What if all our police had the black boxes and cameras first, with the information available to the public 24/7? Then we could all see what a good job the police do, how they spend their time on the job and such, to earn those big city pensions. If every police officer had a web page with their picture, we could recognize our neighborhood cops, just like back in the 1950’s, and they would be our friends again. Right now, they are just a bunch of faceless uniforms, like storm-troopers. It would be better if we knew who they are. I have no problem with the new police surveillance cameras as long as they are all linked to the internet. These are public cameras, in public places, so that all of us can see exactly what the police are looking at. I don’t want them secretly ogling my daughter on the taxpayer dime. Plus, as a public service we can see the weather, traffic, surf and beach crowd, so that we plan our day more efficiently. By the way, these cameras are all ready installed along Mission Beach and Pacific Beach, but the feed is not available to the public. I wonder if a FOIA request could get that information into the public hands? Privacy is an illusion in public places, but an imbalance in accountability between the authorities and citizens is the real problem. As long as we can monitor what the police are doing with their power, there really is not a problem. It is only when they have all the power without any accountability that things get dark. Let the sunshine in. why even bother installing these expensive cameras in the first place? Doesn’t Google Earth, not to mention all the military based satellites lurking out there, already have the capability to see into our daily lives without our permission? Their “spying” isn’t new….only their need to drain our already tapped City Budget. Whoever proposed this camera installation should rethink their priorities. Our own current policy makers are more of a threat than their imagined “off shore misconduct” fear-based delusions. Stop the madness. Where is the voice of reason that can bring this ridiculous expenditure and unnecessary invasion of our privacy to light? Why bother putting up lifeguard towers, with those expensive personnel staring out of them all the time? It’s for public safety. And relative to the 400+ people getting six-figure salaries on the city-dime, they aren’t all that expensive.